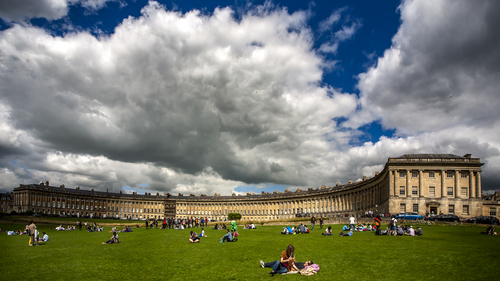 The Royal Crescent is a row of 30 terraced houses laid out in a sweeping crescent in the city of Bath, England. Built between 1767 and 1774, it is among the greatest examples of Georgian architecture to be found in the United Kingdom. Each original purchaser bought a length of the façade, and then employed their own architect to build a house behind the façade to their own specifications; hence what can appear to be two houses is occasionally just one. This system of town planning is betrayed at the rear and can be seen from the road behind the Crescent: while the front is uniform and symmetrical, the rear is a mixture of differing roof heights, juxtapositions and fenestration. This architecture, described as "Queen Anne fronts and Mary-Anne backs", occurs repeatedly in Bath. Lokofoto - 12" x 7.5"
Lokofoto Giclee Print 12" x 7.5"